In my last post, I stated that I’d be sharing some thoughts on college football and I will later today with another post or no later than tomorrow. That’s a promise for any sports gambling addict readers who’ve been waiting with bated breath to read my words. I just wanted to share a couple of quick thoughts. One on JJG, which I wrote about a couple of months ago. 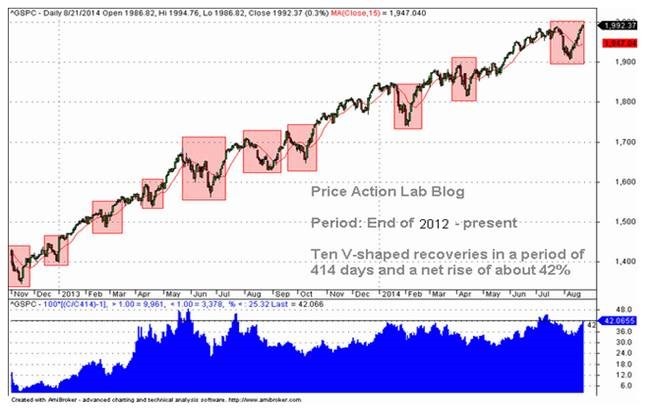 Additionally, I wanted to share a note from the Price Action Lab blog as well. I regularly follow Mr. Harris’s work, but his note on Friday the 19th was the best work I’ve seen out of him. For any readers who deign to label themselves technical analysts it’s a must-read. Really it’s a must read for any trader. In the very short but sweet article he covers these BTFD, V-shaped recoveries that started in 2012, agreeing with the timeline I also posited when squiggly-reading began losing its efficacy. Harris hypothesizes that this is due to central bank intervention. Have a look at the chart for yourself and consider back to the hard balance sheet expansion of the world’s central banks. Harris goes on to opine that indexing’s time in the sun may have an abrupt shift into darkness. As for the last 5 years, he also basically states that what has been won’t always be. Take it for whatever it’s worth, but I recommend taking a few minutes to ingest the article. Regarding JJG, don’t feel bad if you tried to bottom-tick that one too early. Them’s the breaks. I had stated that the trade looked ripe but that my indicators weren’t giving me a go. 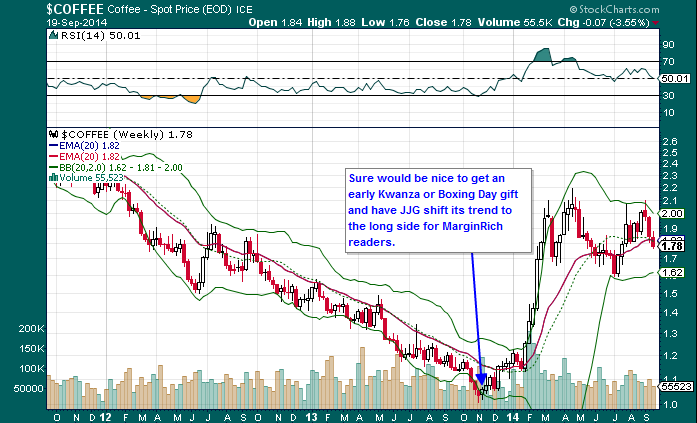 I also stated that I would send out an update if the indicators give the green light. Now this ain’t the update for the green light, it’s just to let any readers know that we’re still keeping an eye on the ETF. Soybeans, corn, and wheat are getting destroyed. It’s serious destruction and the greater commodity index (CRB) just took a dip past support, so it’s not looking good for a trade anytime in the immediate future. However, one of my indicators has flattened out and the other appears to be following. Even if they do shift, that may simply lead to some bottom bouncing consolidation for several months as opposed to a V-shaped rocket ride upward. I wouldn’t expect a coffee style abrupt turnaround, but anything’s possible. 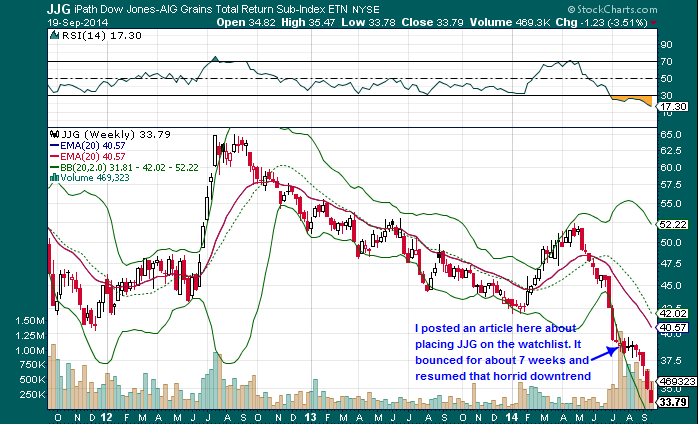 Have a look at the weekly JJG chart in case you haven’t in a while. Once the indicators have turned in favor of an uptrend, then the HFT shops may just juice this thing for nice little return. I hope to have you along for the ride on the timing of that one. We’ll have to wait and see. For reference sake, let’s take a look back at coffee’s beautiful halt to its downtrend and abrupt rocket ride upwards for the lucky schleps(or skilled) who rode that trend to the bank. Alright, so read that article from the Price Action Lab blog. Keep a wary eye on soybeans, corn, and wheat. And enjoy Saturday. College football is back, so go pay your bookie a visit and dare to be great. PS: Marginrich.com does not condone nor endorse any illegal activity regarding unsanctioned and unlicensed sports wagering. If you are compelled beyond your will to place wagers on the outcome of any sporting event maybe it’s time to seek counseling and admit the problem is real. Read those two sentences really fast like the MicroMachines commercial guy with the moustache from the 80’s and it’ll sound real official. And for anyone who thinks I’m insensitive to the genuine sickness that is a gambling addiction and reads articles here, get real, I write about speculation regularly.